I had hoped to get a ‘full’ five games in to show my support for the current initiative - but such is the amount of SoA admin and shows hours at this time of year, it was very much pushed to the last week or so. 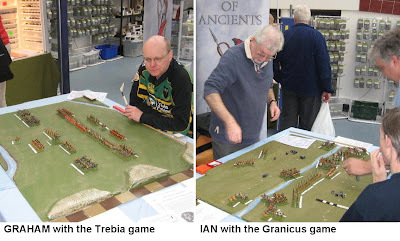 Nevertheless, what a joy, to settle down to a simple, evening game of Armati – in this case a Roman Civil War with show teamer Graham Evans. The Championship looks to have passed its trial year, so roll on 2010. Remember, any two members can play each other and count the score in the Championship by sending the results in. 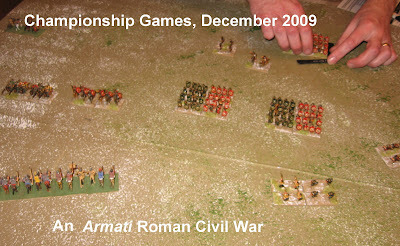 You cannot play the same player more than twice, and the only restriction on the game is that it must be an ancient/medieval historical game, offer a fair and equal chance to both sides, and be capable of delivering an unequivocal win/lose/draw result for scoring purposes (though players may well agree between themselves how this applies). All that said, I suspect mine will be figure games. 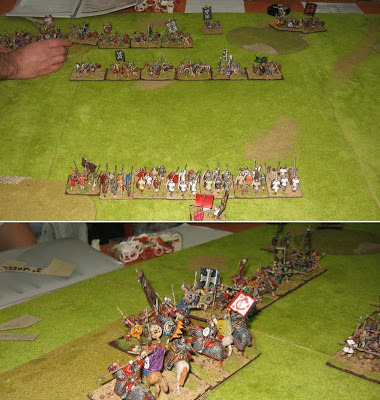 This year, I played 2 FoG and 3 Armati games (against 4 other members – it would have been more games but the snow deluge cause some ‘return matches’ to be cancelled) – all in my preferred 15mm scale, using Romans, Medieval Italians and Dark Age Spanish. I wonder who is up for what …. 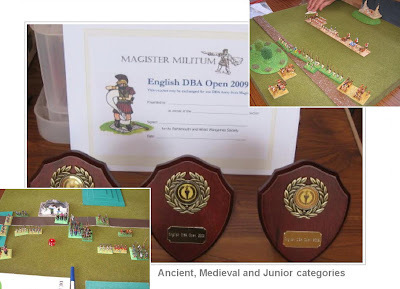 Actually a very rewarding multiplayer role-playing and map game from the John Bassett stable. Followed by a very sociable evening afterwards as we relaxed in the run up to Christmas. I managed to get a copy of Barry Strauss's book at a discount in the closing down sale at Borders in Tottenham Court Road - so tried to get in the spirit ahead of schedule (a good job it was only spirit I was looking for as facts are few and far between ... and Strauss as much obscures them as illuminates them ...).. The game is part of a developing approach to representing the end of the Republic, and I anticipate further developments in the new year (indeed, I hope that if I don't spill all the beans now, John will be contributing an article for Slingshot in the fullness of time ....).. 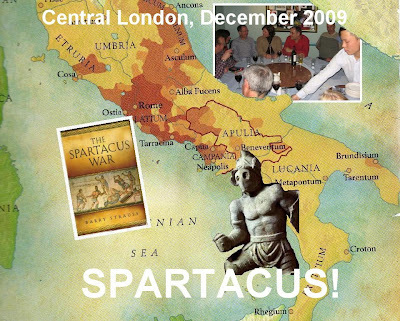 I got myself badly beaten up in the opening battle against Spartacus (OK - no battle ... 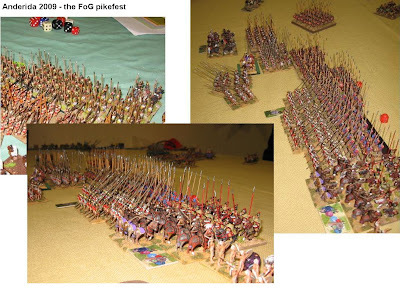 I got myself ambushed ... some Thracian thing going on was my final memory ...)... and scurried off not in disgrace to Rome but in desperation to my old chum Pompey who was on his way back from victory in Spain. As a consequence, I took over the role of Pompey and all the advantages of his veteran army (and all the ethical/political issues of the great commanders of the Late Republic). The immensely powerful and loyal army (no hyperbole in either case) is an interesting tool: it means you hold the ultimate sanction ... a military government or a Civil War you are bound to win - and almost automatic defeat for your opponents. It almost seems that precisely because you hold all the cards, the other factions will oppose you: however modest your demands. There is a human factor in this. It is an interesting conundrum, and one the game made me think about afresh. 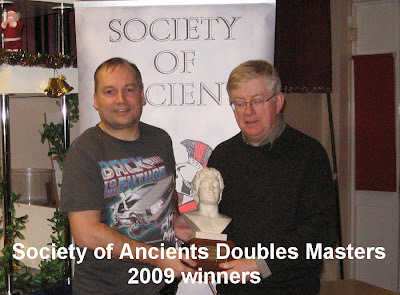 Graham Fordham provided the 'man'power in the afternoon, enabling me to head north for Derby in time to present the trophies at the end of the Doubles Event. Thanks to everyone for getting that to work: actually it is a real pleasure to do two events on the same day, but it can only really happen when everyone helps. 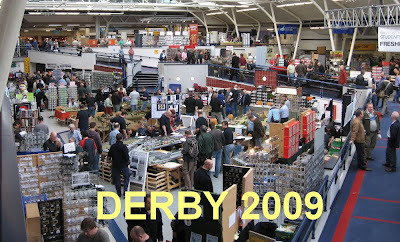 Wargamer is one of those smaller shows that the West Midlands seems to excel at, and was our last official outing before Christmas. We handed out a few more sample issues of Slingshot, of course, but mostly dealt with subscriptions for next year and enquiries. It was also a last chance to spend some money with the traders, entertain the visitors and put the year to bed. 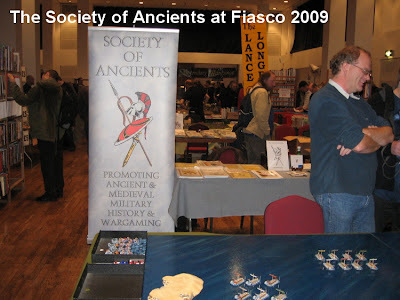 Thanks from the Society of Ancients to all the show and event organisers ... 27 of them, for me, this year ... that's a lot of people mucking in to help us make sure the public doesn't miss out on ancient and medieval warfare. 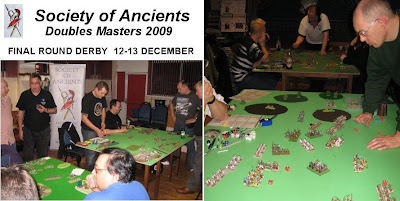 Now a Field of Glory event, this was the final round of this year's Society of Ancients Doubles Masters, and all to play for. 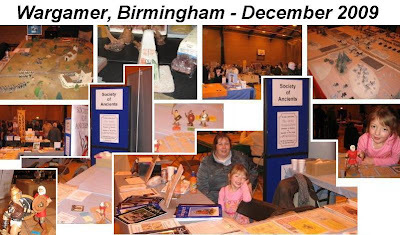 A busy weekend, as, on Sunday we were also due to be at the 'Wargamer' show in Birmingham. Nevertheless, I managed to get a game in on the Saturday - partnering Lynda Fairhurst as her Scots took on the well-fancied Handley/Sharp Hungarians. Next year will see a major change to the Doubles, and a reduction to two larger events, one in England, one in Scotland. The English event will 31st July/1st August at Wheatley Campus just outside Oxford (again, details can be found on the BHGS website). We look forward to a great weekend. 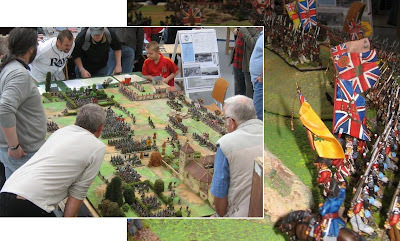 Whilst some shows seem to have fallen away slightly over recent years, Warfare at the Rivermead seems to get better every year. once upon a time, it seemed the main hall was sufficient to house the trade and display games, the gym was spaciously accommodating competitions. Now the show proper takes the main Hall and half the gym, the competitions fill out the rest of the space, there is even a strange room right down the back with Warhammer stuff in it. 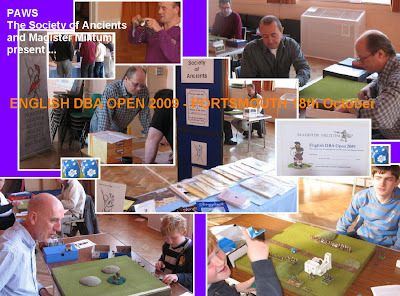 The ancients competitions have always been very well supported, and with a good range of trade and games, this is an excellent event which fully demonstrates that the way to succeed is to stick to that traditional balance, mixing plenty of stuff to join in with and try out with the shopping and competitions. 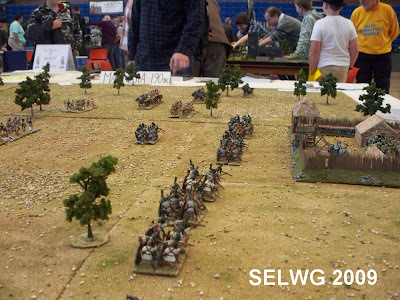 The Society of Ancients followed a now regular formula at this show ... a large 25mm Lost Battles participation game with author Philip Sabin on the Saturday, swapping to a Medieval Warfare try-out game with David Edwards and Kevin Large on the Sunday. 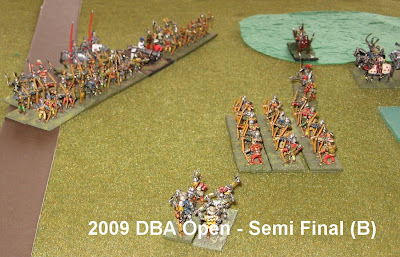 That said, this blog is mostly about ancients. 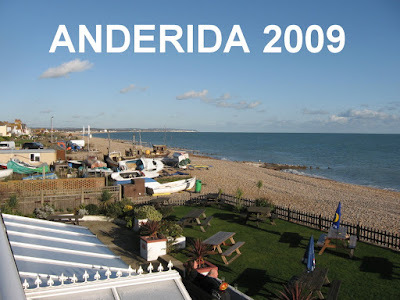 Yes, Pevensey Bay still looks as bright and blue as this, in Early November. 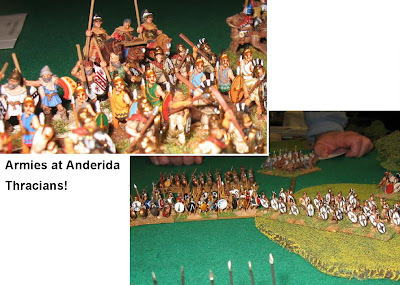 Many thanks to Eric Cruttenden and his team for continuing to bring us the Anderida event and its unique flavour. 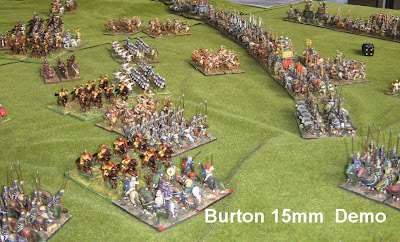 As an unashamed 15mm enthusiast, I delight every year in the trouble the entrants take over their armies - and actually just the brilliance of what they achieve. 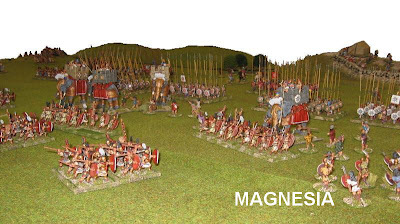 There is something about the size of 15mm and its ratio to table space that makes the spectacle of massed miniature armies in this scale unsurpassed, I think. And at this annual event, for sure, the effort is always appreciated. OK ... While we're doing the beach view thing, I thought I'd indulge you a view of the local night-life. 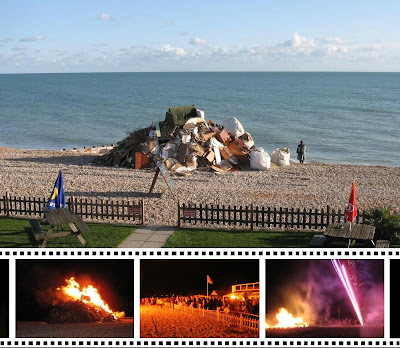 Not quite a pagan festival, there was certainly a ritual burning! Anderida is held on the weekend of Remembrance Sunday ... and this year that also meant that on the Saturday night they had organised their Guy Fawkes celebration. Quite handy to have a beach at your disposal. All this took place right outside the Aqua Club, the event's now traditional venue. The event now embraces an extensive FoG competition as well as its traditional DBM. The big prize of the event is the annual Society of Ancients trophy - not, of course, for the top scorers, but for the most valued contributors ... and appropriately half the Society Committee were playing (and the last two Slingshot editors usually umpire the competitions) so it has a bit of a family atmosphere. 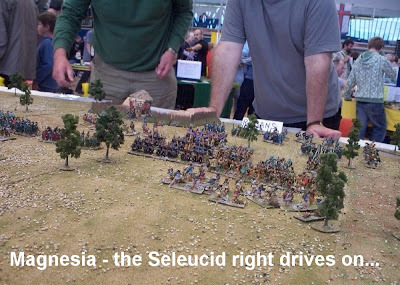 Yes, Chris and I did OK, and our Graeco-Bactrians had four entertaining games against Seleucids, Early Successors, Persians and Classical Indians (2 wins saw us sneak into the top half of the table in 9th place) ... You can get a full round up of results, and more pictures on the Anderida website (here ...) but the top teams were ... (FOG winners) Ian Stewart and Richard Collins (DBM winners) Darrell Pearce and Jeremy Morgan. 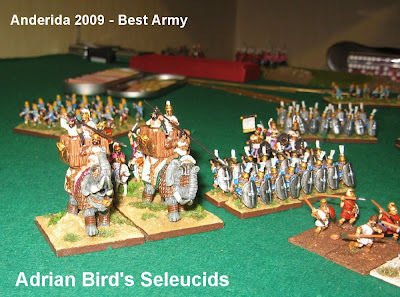 Coming up trumps again in the best army category, Adrian Bird's colourful style caught the judges eye, and his Seleucid army took first prize. 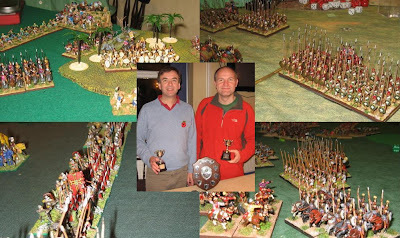 The blue ribbon award went to Kevin Large and Andy Rourke for an all round warmly appreciated contribution - helpful and entertaining play, good 'up for it' wargaming and a smartly turned-out Thracian army that was a contender in the painting prizes. As you can see from the photos, I was quite impressed with the deep gloss varnished 'deep sea' terrain boards they had borrowed for the event ... I hope you enjoy that reflective quality I tried to capture. 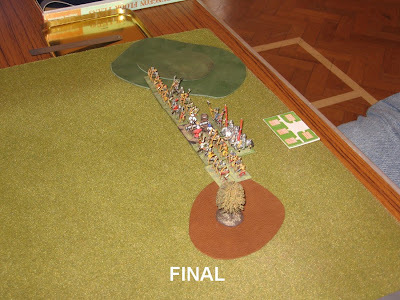 For a less 'arty' look at the game, and loads more pictures, you can try James Roach's blog ( here ...). 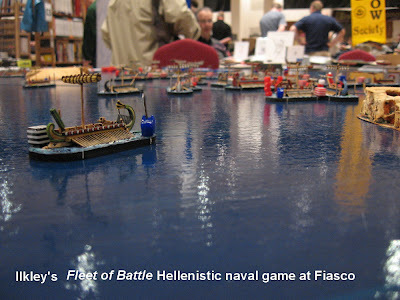 The game is based on Piquet and features Xyston model ships. It seemed to work very well and looked splendid. Full marks, lads - and nice to be sited next to an ancients game. 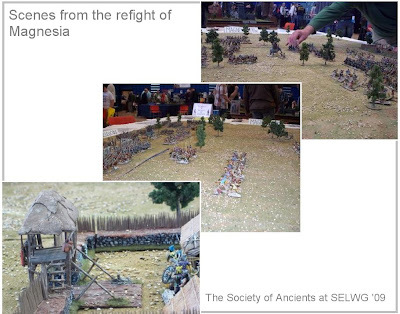 For another option, you might like to take a look at the Society of Ancients edition of Richard lee's Corvus (see it on the website's games page ...) ... If you get the chance to play either of these games at future shows take advantage. Always good to see the warships at work. Also available from the website, our own featured game was the gladiators classic, Gladiolus. An excellent participation game, and popular with kids and grown-ups alike. We had some fun with this, as usual. 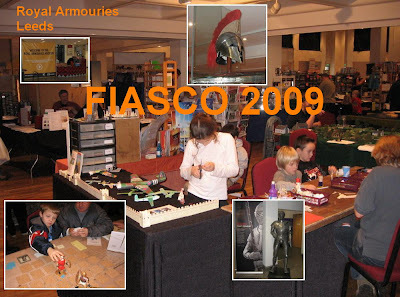 Elsewhere, Fiasco had the usual mix of games, displays and traders ... I was particularly impressed by the range of dice the Dice Guys had on offer (yes, the do ... dice). 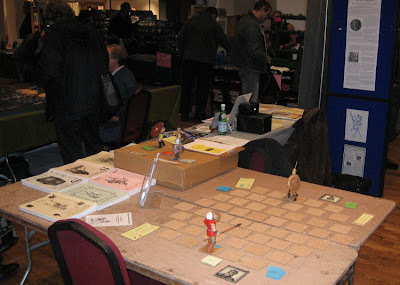 Although perhaps there are slightly fewer of them, the quality of the games at Fiasco is always good (I suspect you'll guess which impressed us this year, though), and there's plenty for the younger ones to do too. Put it in your diaries for next year. 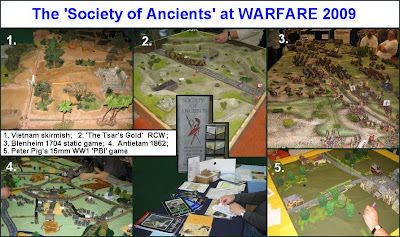 Sunday saw the first Society of Ancients gathering without an AGM - just a Games Day ... and an opportunity to meet the Committee. There weren't that many of us there, but this was a first toe in the water - and I guess it meant less hosting and more games playing for the Committee. 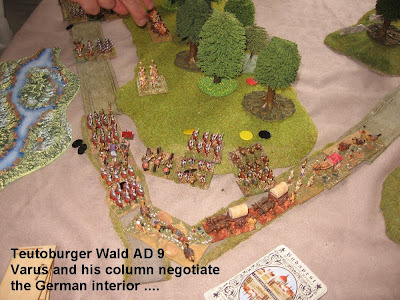 It proved a tightly fought affair ... Daivid learning Armati as he went, me paying insufficient attention to my own army as I explained to him the nuances of his! 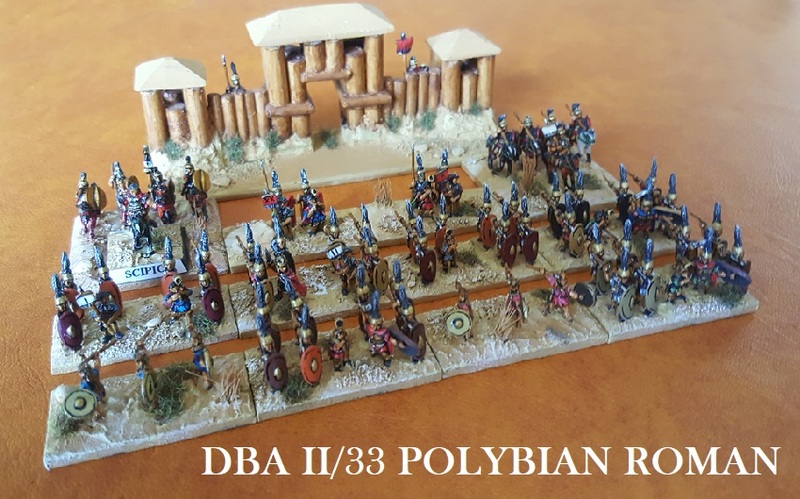 I had the legionaries deployed wide (their more vulnerable formation confronted by Hannibal's warbands ..) .. and only just survived the onslaught (with the lost of one eagle ...)... The game turned on a cavalry melee area. 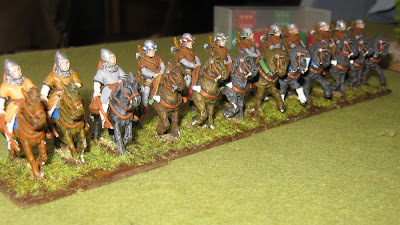 Armati cognoscenti may recognise three mounted units here, all one BP off being broken (that means whoever loses next time is removed ... draws will not count as mutual destruction does not happen. 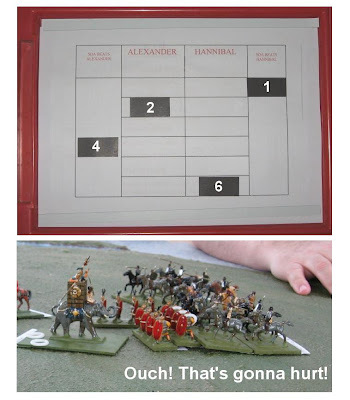 The Spanish must fight each Roman unit individually - and have not been 'spooked' by the camels ...) .. And yes, if the Carthaginian breaks both Roman units Hannibal wins .. if the Spanish break, Hannibal loses. 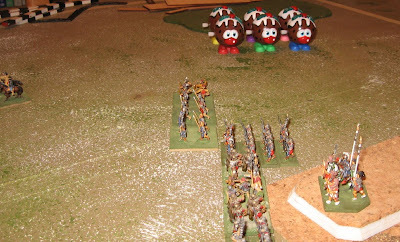 Ignore the little dice (they mark three fatigues per unit .. so everyone is tired!). 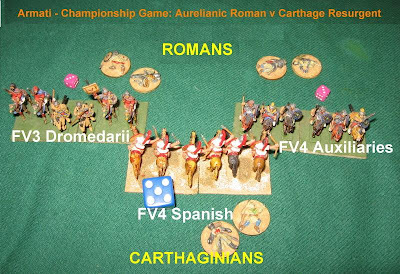 The big blue die is the Carthaginians rolling a very powerful 5! 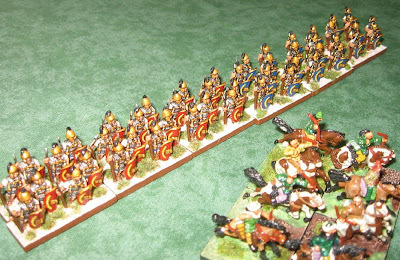 The Roman Auxiliary cavalry fight first .. a 6 wins the game, a 5 squares the melee, a 4 sees them break and leaves the Spanish odds on to see off the Camels next turn to win the game. They roll a 5! 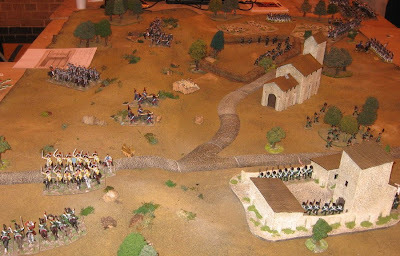 The Camels fight next and must roll a 6 to square the melee and survive another turn - they are 1 FV down, so are in a 'no win situation' against a 5. Excellent game, and a Championship win for the Romans. Ken Cooper took over my Romans for another bash, and deployed the Roman infantry deep to resist warband... a much more productive arrangement, even though (another newcomer to the rules) he did it without understanding the full implications... Fortuitously the (now overmatched) Celts were deployed directly to the Legionaries' front and got some very nasty treatment. The Romans dealt with their foes more methodically this time. 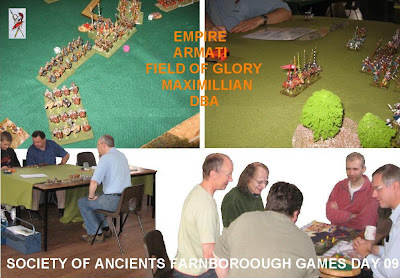 Elsewhere I saw games of Field of Glory, Command and Colours and Maximilian, I think .. as well as Phil's Empire participation table which ran pretty much all day. Please give me a shout if there is something played this year which I have missed off. 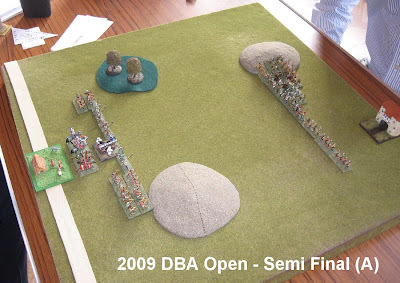 As I said above, this is 'year one' for SoA moving on from an AGM based event to a general member invitational event or events, and was quite low key. It is a good base from which to start, and I hope more will come of this in future years. 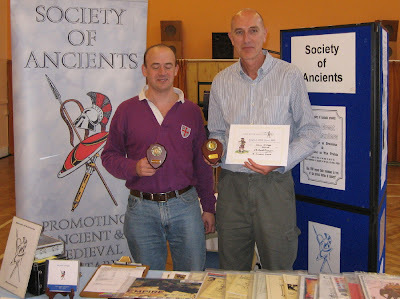 we are by no means restricted to a single event nor to the South of England ... so if you want a Society of Ancients member event in your region/country, think about how you would go about organising one and get in touch with the Committee. Oh! 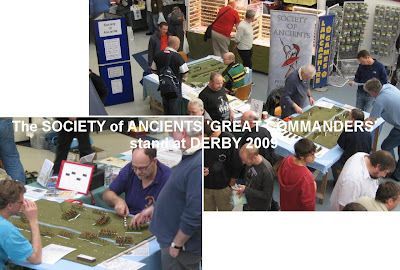 ... and don't forget those Society of Ancients Championship games ... 3 more months to go, so get some games played and send results in to Bill - he's dying to hear from you! * ... in parentheses, 'WF' signifies the list drawn upon one available free from Warflute, 'A2' signifies one printed in Armati 2nd edition lists section.